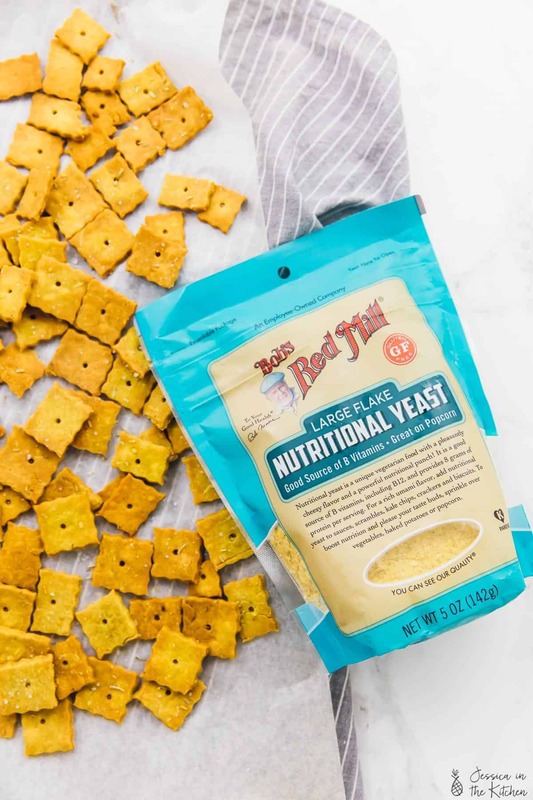 These Vegan Herbed Parmesan Crackers are done in 30 minutes! They are easy to make in one bowl, are crispy and flaky, and gluten free! Do you know what I realised? I have never made crackers for you before! What?? 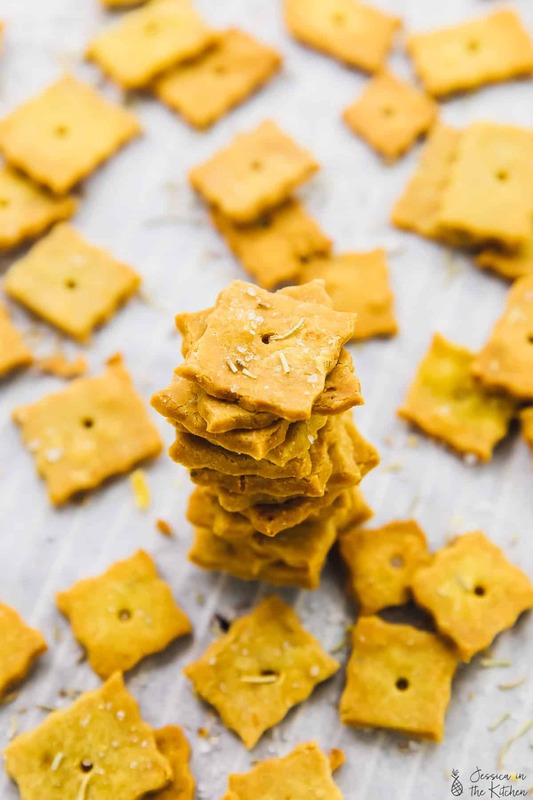 A good cracker is definitely essential to snacking and catching up on your favourite shows, and there’s no reason why you shouldn’t be able to make one at home. Honestly, it’s the best of both worlds. You can whip them up in 30 minutes, AND you can have crackers flavoured EXACTLY to your liking. Hello night in! 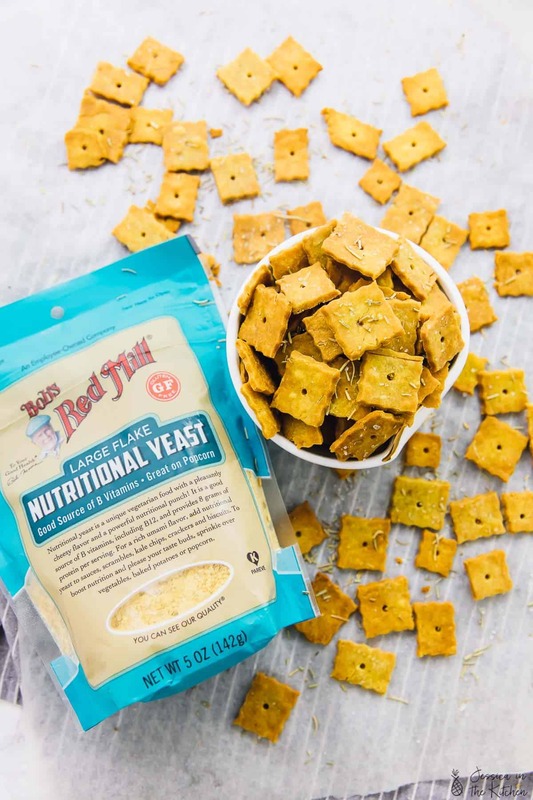 “Nutritional yeast aka nooch is an inactive yeast made from sugarcane and beet molasses. Think of it like mushrooms. Because it’s inactive yeast, you can’t use it to cook. However, it is basically a super food – it is high in B12, protein, folate, thiamine, riboflavin, niacin, selenium and zinc. I wanted to take advantage of that cheesy flavour here, and to make these Parmesan crackers. 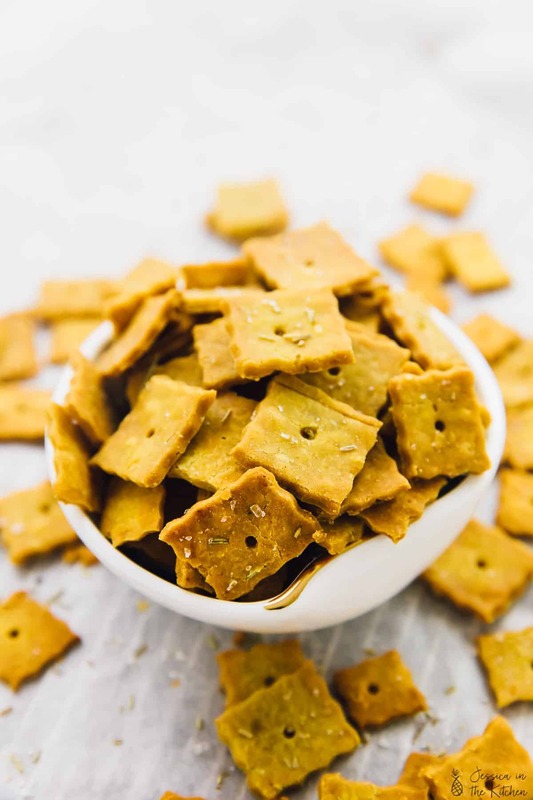 I used the seasonings in my vegan Parmesan cheese recipe to amp up these crispy crackers which really made these taste so amazing. 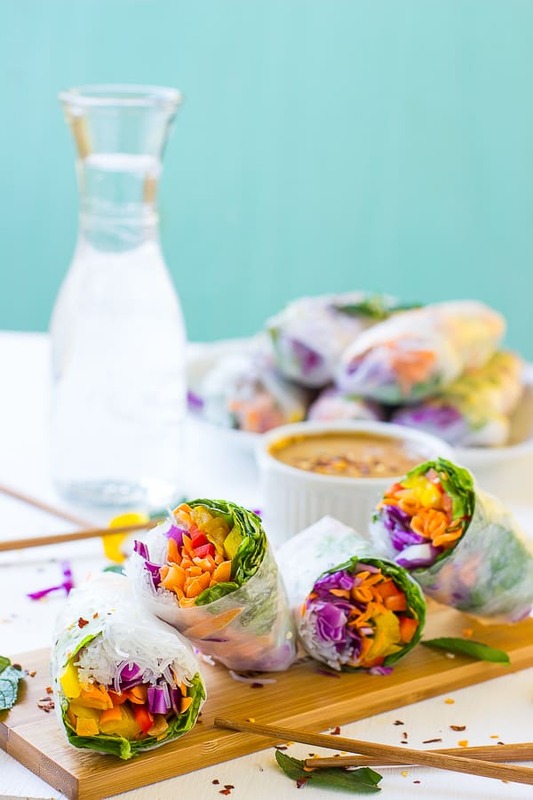 Of course I wanted everyone to be able to try them, so I made them gluten free and vegan too! I love that the gluten free flour held up so well in these. Trust me, these have the flavour of the buttery, flaky crackers that you know and love. Try them out and let me know what you think friends! Q: Why is my dough impossible to manipulate? A: It might be too dry! Try and add a teaspoon of water at a time to get it moist enough but not wet. You can avoid this by measuring out the ingredients using a kitchen scale. Q: Why aren’t my crackers crisp/a little bit dough-y on the inside? A: If you made your crackers thicker than ⅛ inch, they won’t bake in time. Bake them for about 3 more minutes depending on thickness, watching so they don’t burn. Q: Can I switch up the flavours? A: Yes you can! You can use thyme instead of rosemary, or even add smoked paprika to enhance the flavour of the nutritional yeast. This post is sponsored by Bob’s Red Mill. Thanks so much for supporting the brands who support Jessica in the Kitchen! All texts and opinions are my own. In a large bowl, add all the dry ingredients and stir together. Pour in the olive oil and the ice water and using your hands, mix together into pea sized crumbs until the liquid is incorporated, and then form together with your hands until a dough comes together. The dough may look a bit dry and crumbly at first. It can take a while to absorb the liquid. You can add about a tablespoon of water to the dough if after a minute it’s still dry and hard to use. Knead the dough together for about two minutes. Wrap the dough with cling wrap and place in the freezer for about 10 minutes while you preheat your oven to 400°F/200°C. Remove the dough and using a rolling pin, roll the dough on a parchment paper to less than a ⅛ inch aka, as thin as you can. This will guarantee a nice crispy and flaky cracker. Try and roll it as even as possible as well to ensure the crackers bake evenly. 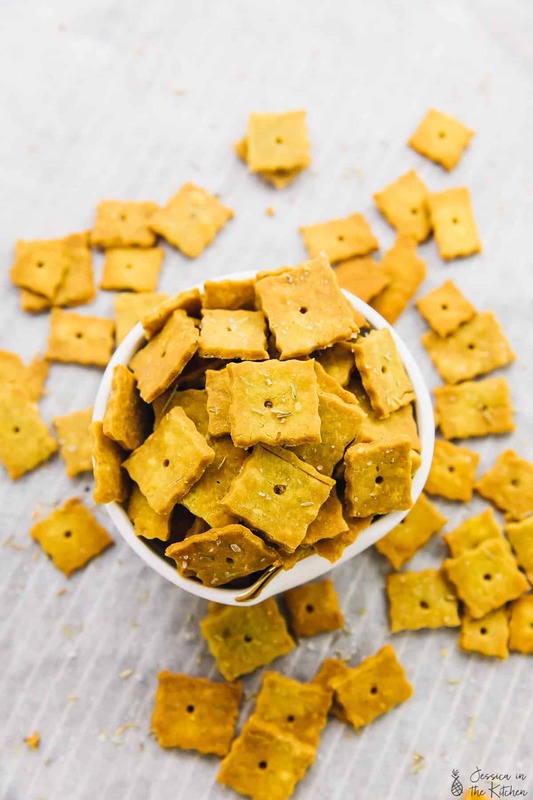 Using a knife or a pastry cutter, cut the crackers into 1 inch squares, up and down the dough. Poke a decorative hole into each cracker. Remove the crackers one by one and place on a lined parchment, or separate them on the same parchment (I find putting them on a different one much easier), ensuring they aren’t touching. Sprinkle with extra sea salt on top. Bake the crackers for 10-12 minutes. If they aren’t totally even, some may bake faster than others at the 10 minute mark, and others will take the full 12 minutes to bake. Remove from the oven and let cool completely. If they aren’t crispy as soon as they come out of the oven they will crisp up once cooled. Serve and enjoy! I was craving cheese crackers tonight and had a chunk of parmesan in the fridge. This recipe was so quick and easy, and they are perfect! Thanks! I’m not usually tempted to make homemade crackers but these look incredible. 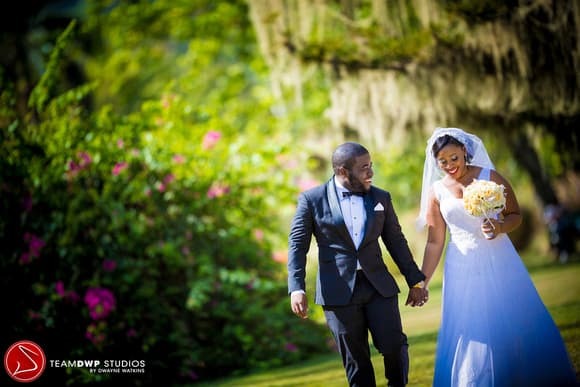 great job and beautiful photos. Thanks Stella!! I hope you enjoy if you try them!! Can ordinary flour be used? Yes you can use regular flour!! These look amazing! Wondering if a flour substitute could be used such as arrowroot powder, coconut flour or even almond flour? Thanks!! Hmm, I’m not sure about arrowroot powder or coconut flour (too thick) but I do think almond flour could work! It might not be the exact same texture though, but out of the list would work the best! May I substitute whole wheat flour for gluten free flour? Yes you can! I haven’t tried whole wheat flour with this, so maybe half regular flour half whole wheat would be better. I hope that helps! Can you have any other kinds of fat? Such as butter? Hi! I live in the Netherlands and can’t get this kind of gluten free flour. Could I use ordinary flour in the same amounts or do I need to change them? I haven’t tried that so I can’t guarantee it, but it should be able to work. Let me know if it does!